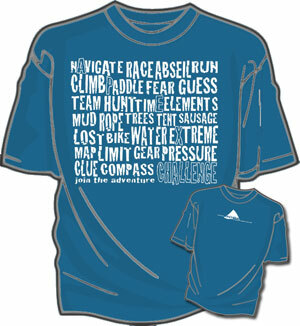 The design of the 2011 Apex Challenge T-shirt is now complete and is already proving very popular with people who've seen it! Once more, Nancy Alford has come up with a bold design that tries to capture some of the essence of what the Apex Challenge is all about. This year she's used a stylised wordsearch as her inspiration using words that conjure up images of the sort of things people remember about a weekend at one of our competitions. As you look closer you realise that that within these words you can also find the text, 'Apex Challenge' subtly picked out as well. Staying with the design used in recent years the back of the T-shirt shows an Apex Challenge logo with the event website. The printing is a bold bright white on a sapphire blue which is sure to stand out no matter where it is worn! Only those taking part in our 2011 competitions will be able to get hold of these t-shirts. In the past almost all the teams have been wearing them and many Scouts say they enjoy wearing them at other events for many months afterwards as well. If you didn't pre-order yours when you entered the event then it's still possible to get your hands on one. They're just £5 each and you can contact us to place your order. There'll also be a limited number of spares available at the event, but to avoid disappointment make sure you pre-order yours in advance! We're really looking forward to seeing so many people wearing them during the events. We're able to offer you them at the fantastic price of just £5 thanks to Shawcross Printers of Wakefield who have agreed to make them up for us at a special rate. Sizes described on the entry form are approximate.